Here are all five tips, and here’s my post on the first one. Comments are great. All bloggers love comments. They make us feel special. Almost as special as a link. Depending on your blog love language (which Simone posted about back in January). Comments indicate reader engagement. Comments – even negative ones – show that someone cares enough about your ideas to respond. But if you hang your blogging hat on the number of comments you get – and make a decision to continue, or not to continue, on that basis – then you’re bound for disappointment. People don’t like to comment. I read about 300 blogs, I comment on a handful. I should comment on more – knowing as I do that people like getting comments. 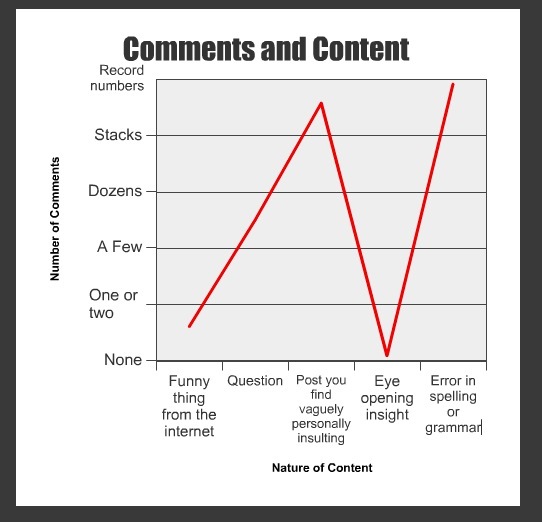 Comments are not a measure of quality. They’re not a measure of how much your post is appreciated. They’re not really a measure of anything except how good you are at annoying people or how cleverly you hook your readers. Because I like awesome scientific analysis I’ll repost this graph I made a while back. And further analysis – I mentioned how bad my blog was when I first started the other day (prompting some people to head back to the archives). It was really bad. Terrible. And yet I scored more comments per post in those days by a long shot. If you’re going to blog for any measurable outcome regular visitors and subscribers. Or blog for google keywords so that you can attract random visitors who might subscribe. Blogging for comments is a thankless exercise. Bit like preaching for laughs isn't it? Temporarily gratifying, with an almost certain downturn in quality if that is why you're doing it. It might depend on what you think is terrible. Your post prompted me to go back and read some of your first posts, and I enjoyed them more, *on average*, than I do many of your posts now. But that's probably just an interest-based thing. I certainly changed my style somewhere along the line – and the type of content I put up. The first batch were mostly about me, now I write mostly about things that interest me.